You can track me live on Sunday starting at around 8am/9am (ish) ET via the website or Ironman tracker app. Look me up using name “Dylan Davison” or my bib number “1369” under the IRONMAN Florida event. The tracker updates every few miles so you can track the entire day. Race should take about 6 hours or so depending on the Wind and the Heat (20 mph winds on the bike and 90 degree heat on the run will both make the race challenging). I’m including some extra details for those of you who are new to this campaign! I have an exciting announcement! I’m going to be racing in an IRONMAN 70.3 Triathlon. Today is my birthday and I’m really excited about this race and the support of all my family and friends as we try to raise money and awareness for No Stomach For Cancer. I have yet to do a race like this without a stomach and I’m sure it won’t be easy. Please join me in fundraising efforts and share this page! 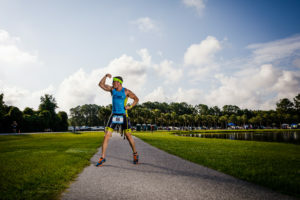 Ya’ll – I did another Triathlon. Here is a picture of around mile 2 of the run. This sprint triathlon is a 600-meter swim, 12-mile bike, and 3-mile run. I hope you don’t mind the dorky picture. I get a bit loopy during these events. It was hot and I couldn’t catch my breath on the run. I felt like I had nothing left to give. I wanted to quit but fought through it. My goal was to post my best time ever but I came up 20 seconds short of my personal best. I DID, however, improve my time by 23 seconds from last race. I was motivated to fight for a personal best after I met so many sweet people in Tampa that encouraged me to keep improving and fighting to get better. They told me it encouraged them seeing me doing triathlon and improve my times. The next race is July 29 and I’m already excited! I’m trying to increase my training, while not losing weight. It’s not easy. I weigh 161 lbs and my body fat has to be in the single digits. I weighed 202 prior to surgery. It’s pretty crazy. I don’t want to go any lighter because I know my training load will increase if I do the Ironman 70.3 in Wilmington in October. I have until July/August to figure it all out – assuming they don’t sell out the event. The Ironman 70.3 is exciting, but I’m hopeful I can also run a Marathon by the end of this year and hopefully a full Ironman (140.6 miles) in November of 2019. I want to use those events to fundraise for No Stomach For Cancer as they help fund research for CDH1 gene mutation. I hope you will stay tuned and keep reading along as I figure this all out. I need to focus on staying healthy and fueled so I can keep training. I feel very blessed. I attended The Spotlight on Gastric Cancer event which was put on by No Stomach For Cancer and Moffitt Cancer Center. I was able to meet many former cancer patients and several fellow stomachless friends. It blessed me because we all have different stories, but we all have/had similar struggles. I was reminded how difficult the “early days” were. They had no rules. We all have those “crazy” stories. But – we are still here! We are happy, healthy, and full of life. We have lost family members, but we are motivated to help others through the difficulties of this disease and live the best life possible. A new technique where they introduce chemo during surgery. This seems to be very new and they are still doing research. I met several strong, inspiring people this weekend. One impactful moment was listening to a mother who was diagnosed with stage 4 gastric cancer and was given a 4% chance of survival. She fought through several (seven I think) rounds of chemo and radiation. Not only did she make a full recovery; she had a successful TG. And because she had the CDH1 gene mutation, her own two daughters, her sister and her niece, all of which were CDH1 gene mutation positive, had successful TG’s all within a few months. It was very special and inspiring to hear their story. I also was able to meet a fellow stomachless friend who also suffers from celiac disease! That was cool. We exchanged numbers and I hope we can keep in touch as we share a similar journey. Y’all are brave. I encourage you to share your story as you never know who it will encourage. A fellow stomachless friend reached out to me asking me about how I got back into training. So – I wanted to share how it worked for me. Keep in mind that everyone’s recovery is different. I would encourage you not to get frustrated, go slow, and stay patient. I had my total gastrectomy on Jan 6th and ran my first mile Feb 16th and finished 4th in a Sprint Triathlon May 20th. It’s also worth mentioning, through over 10 events, I scored my 2nd best time. I sound “braggy”…. But – the reason I share this is because I remember early January feeling much doubt and not sure if I would ever run again. So, I share this to provide hope that you can still live a fantastic exciting life without a stomach. Please don’t take this as gospel – meaning – this isn’t a one-size-fits-all. Everyone is different. Go slow and listen to your body. When in doubt, take a day off and rest. Also – please note that recovery is much more intense post opp. Example – I used to work out 6 days a week. Now – I can currently work out 3 days a week or so. After about two weeks after the surgery, I started walking a mile or so every other day. Then, I would walk a mile, two days in a row, followed by a day off. Then 1.5 miles, or 2 miles. I would then increase the speed of my walks. I would build up to about an 18min/mile pace, then 16min mile pace, then 14 min mile pace. I would walk slow for a mile, then speed up to 14min mile pace (feels like your speed walking) and I would do that for a mile or so, then slow back down to normal walking pace. After you do that for a few weeks, you should feel like you either need to keep doing it, or you feel like it’s too easy and you’re ready for a jog. Make sure you warm up well – then job for a few minutes. Feel your body. If it hurts, go back to walking, if it doesn’t, keep jogging for a mile or so. They key is to take it easy and don’t overdo it. Your body will respond very well if you lightly train and take recovery days seriously. I kept it that way and in no time – I was up to running 4 miles (April 3rd). My pace is much slower, but it feels so amazing to go out and run knowing everything we have been through. Swimming was a bit uncomfortable for some time. Since I had open surgery, the healing takes a while. It wasn’t until April 20th that I was able to swim 1,500 meters without pain. It’s still tight when I first start swimming, but it feels fine after a few minutes of warm up. I struggled with drinking water early on. Strangely enough, once my heart rate goes up and I sweat a bit – I can drink much more easily. I don’t even really think about it when I drink while training. Same is true with my sugar drinks while training. They have not given me issues assuming I “need” them due to hard effort. While you introduce “nutrition” on your longer sessions, be cautious and don’t overdo it. Perhaps sip on your drink one day at home to ensure it will sit well. Your body will also change quickly. Example: I used to drink Gatorade G2 the first few weeks after surgery. Now – it can’t drink it as it makes me run to the bathroom. Not sure what changed – but it’s a no go. Gatorade Endurance gives me no issues, but I only drink it during training sessions. I’m starting my triathlon training again. Boy, it’s not going as well as I had hoped. I get tired very easily and I’m sore for days after a tough day. I also noticed that I get affected by colds/allergies/sickness much easier. For example, I have had “drainage” and a cough for almost 3 weeks. I suspect it’s because of my immune system isn’t as strong as it used to be. I wanted to come back this triathlon season and win races to raise awareness for No Stomach For Cancer and how much they helped me. However, at this point, I’ll have to race to finish, rather than race to win. Oh well – maybe next year. Lastly, last night I had horrible reflux. The worst ever. The taste was so bad I was gagging and dry heaving which kind of scares me since I have yet to vomit without a stomach. After it all settles down following some crackers and water, I have heartburn the following day and that awful taste in my mouth. It’s a bit discouraging as I don’t know why it all happened. I have a feeling that these things just “happen” with life after no stomach. I just hope it doesn’t happen very much. Hopeful for a great week! I know it’s been a while since I have updated. I’m sure this won’t be the last time there is a large gap in time between updates. Things have been going pretty well, however, for those of you who have done this know, no day is safe. Blood sugar crash is much scarier. I feel weak and as if I have the flu. I become very slow in thought. I sweat and get hit with intense hunger. I know that I typically need 15g-20g of carbs to recover and the ride will be over in 15-20min. However, I have the sudden appetite for 1,000 calories and 250g of carbs. I have to be very careful I don’t overeat during this time. If I do, I get horrible cramps. It’s a mistake you will not want to make again. Outside of those, I get reflux from time to time. The remedy for me is gluten-free crackers and a little bit of liquid. Coffee during the day and water during the night. Just be careful not to eat too much. Take small bites and chew like you just had surgery. During reflux, it feels like everything get’s stuck in your esophagus so if you eat too much, it could be a bad mixture. Eating during reflux seems counterintuitive but it has worked every time. So, along with my blood sugar management snacks, I now take some reflux snacks too. I’m basically always taking an entire days worth of snacks with me because I never know what the day will be like. I had the kids at Wal-Mart the other day while my wife was meeting with a friend. My nearly 3-year old was being very energetic. All the sudden, I felt really tired and weak. I took a second to check how I feel. Yup, I’m sweating. I could feel my blood sugar was low. I suspect, the high sixties or low seventies. I grabbed a Gatorade and started sipping. Before I left the store, I was on my way back to normal. It was a bit crazy though. I forget that I’m in charge of my kids and I have to be prepared for these situations so I can stay coherent and keep the kiddos safe. I never really thought about it before. I return to work on Monday. To be honest, these 11 weeks have gone by way too fast. I think it will be hard to go back but I feel like this is a step I have to take in order to get back to the new normal. I have lost a total of 33 pounds and it’s not easy to keep weight on. Last night, my wife and I went out to eat at a restaurant that has a serious Gluten Free (GF) menu. The food and service were great! We were reflecting on this journey and there are parts of it that do not seem real. I can’t believe we did this and I’m thankful that I no longer have Cancer. It was/is a tough journey, but it was worth it. I know others who have had a much more difficult time with recovery. Thus, I’m very thankful. I feel as if God protected us and I certainly did not deserve it. Wish me luck going back to work!